In the year 1912 (approximately), on one Sunday, Shri Govindrao Dabholkar (popularly called Hemadpant for his great of work Sai Satcharitra) came to me after completing some chapters of Sai Satcharitra. Among them I liked two chapters so much that I requested him to print them. Moreover, we were not sure that people would like all Leelas of Sai Baba compiled in a single book. Moreover if the all the Leelas are published together, then the cost of printing would be very high. So, it was decided that in the beginning, a monthly magazine should be released. Shri Dabholkar took advice of Shri Hari Sitaram Dixit. Like this six months passed and the work of Sai Leela did not progress further. But we were not disappointed. One day, Shri Dixit and Shri Dabholkar came to my home to discuss about Sai Baba's Leelas to be published. Thinking from the other side also, whatever experiences we had in the Holy Feet of Sai Baba were not all fake stories. So the thought of publishing His Leelas would be surprising to the devotees, but truely speaking it would settle down in the hearts of the readers deeply. Moreover it would increase self confidence in them. Keeping this in mind, we decided to step ahead in this matter and thus proceeded to publish Leelas of Sai Baba in the form of a monthly magazine. After deducting the expenses of printing from the first lot of issue of magazine, it was decided that the whole proceeds would be reserved for the same purpose only. First 960 copies became so popular that another 1000 copies were printed. The members of the committee decided to reserve the copyrights of the with me only. Now Sai Baba's sweet experiences and Leelas were been published. Until Shri Dixit was alive, he used to publish the experiences after verifying all of them personally from his side. But after his death now the publication of the magazine is not done in time. After the death of Shri Dabholkar the work back logged for one year. Due to all these reasons, the subscriptions of the Sai Leela decreased from 960 to 400. The whole responsibility of the magazine was now on my old shoulders. I wanted to be away from fame and I had a habit of working from corners. But due the responsibility which came forcibly upon me, Shri Prasanna and Shri Dev encouraged me voluntarily not to neglect my duty. At this old age of seventy, I have to work to meet my family expenses, look over the work of Sai Leela and moreover Shirdi Sai Baba Sansthan has given me the work of treasurer so cruelly. 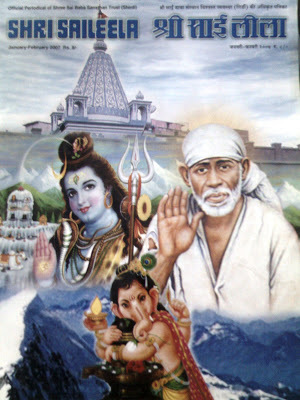 But I thank Sai Baba that everything is going on smoothly because of His grace. People accepted such a poor and ignorant person like me in such a great work, this shows that Sai Baba is with me. Now it was the time to do work and not to speak a word. The whole credit thus goes to Sai Baba only. Today I took pen to write in detail about all this. The only reason behind is that the subscribers of Sai Leela has now reached to 260 as compared to 960 in the beginning. So, after deducting the postal and printing expenses, I will have to spend upto Rs. 250 from my own savings. Keeping all these things in mind and to serve Sai Baba's permanent work, I would say to all Sai Devotees to subscribe the magazine thinking that it is his monthly publication and for him only. In the end I would be ever grateful to Shirdi Sai Baba Sansthan.